Set in the 1930's jazz scene of Manhattan, this story involves how random chance can determine the rest of our lives. From secretarial pools and jazz dives to Gatsby-esque parties and suites at The Plaza, a look at NYC in a most intriguing era with engaging and enchanting characters. From the New York Times-bestselling author of A Gentleman in Moscow, a “sharply stylish” (Boston Globe) novel of a young woman in post-Depression era New York who suddenly finds herself thrust into high society. On the last night of 1937, twenty-five-year-old Katey Kontent is in a second-rate Greenwich Village jazz bar when Tinker Grey, a handsome banker, happens to sit down at the neighboring table. This chance encounter and its startling consequences propel Katey on a year-long journey into the upper echelons of New York society—where she will have little to rely upon other than a bracing wit and her own brand of cool nerve. 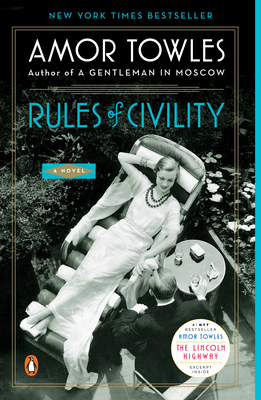 With its sparkling depiction of New York’s social strata, its intricate imagery and themes, and its immensely appealing characters, Rules of Civility won the hearts of readers and critics alike. Born and raised in the Boston area, Amor Towles graduated from Yale College and received an MA in English from Stanford University. His first novel, Rules of Civility, published in 2011, was a New York Times bestseller and was named by The Wall Street Journal as one of the best books of 2011. His second novel, A Gentleman in Moscow, published in 2016, was also a New York Times bestseller and was named as one of the best books of 2016 by the Chicago Tribune, The Washington Post, The Philadelphia Inquirer, the San Francisco Chronicle, and NPR. Both novels have been translated into over fifteen languages. Having worked as an investment professional for over twenty years, Mr. Towles now devotes himself full time to writing in Manhattan, where he lives with his wife and two children.